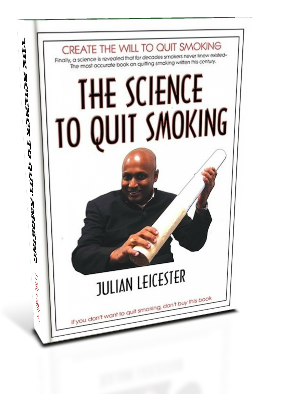 "Julian Leicester teaches you FIVE simple steps to quit smoking for ever. This FREE Book will teach you to be the Cigarette Slayer... and have the will to be always committed to your Health." If you could learn an amazing new way to quit smoking today, will you miss this opportunity in my FREE book for you? How would you like to live your life, do whatever you want, and still not smoke? The science taught in my book is so simple you will probably find it difficult at first to believe that it will work. That’s because you have been brainwashed by cigarette companies and media to believe that quitting your cigarettes is difficult, but it’s not. I call my method the world’s first pleasurebased approach to quitting smoking. A person must be passionate, thrilled, and having fun quitting. They should be happy at the outcome of achieving. Quitting smoking must be so fun to do that it becomes effortless. Seed the subconscious with positive values which is a great tool for effortless change. Develop the strength of your personality and willpower to quit successfully. Get rid of all your inner beliefs about smoking and be relax as you quit smoking. Do something differently and be different to really want to quit,. Think smart all the time: make your smart choice to quit smoking. See the truth of smoking which costs you: it costs your health, your finances, and your family. Decide which is more important to you, and have the courage to walk away from your cigarettes.